Paypal. We use Paypal's secure server to process payments. Even if you don't have a Paypal account, you can use this method to pay by credit or debit card. We've been using Paypal for more than seven years, and have never experienced a single problem. If this method of payment is convenient for you, just click the icon for any item to make instant payment. If you choose this option, then your file will be delivered to you instantly by email. Please note: If you don't receive delivery, it may be in your spam folder. If you send an inquiry and don't get a response from us, that may also be in your spam folder; we are not ignoring you, you are simply not receiving our responses. In this case, please register with our Forum, and leave a message there. We will respond through the Forum. Postal Money Order. You may send a Postal Money Order via the United States Post Office Department, to the mailing location found here. Please be aware that we check this mail only two or three times a month. So if you choose this method, please be patient. Also please include your email address with your order. At this time there are no items in our catalog which will be printed and mailed to you. Everything is digital, and will be delivered by email. Please remember that there are no guarantees that any particular strategy will work for You. The best strategy is diligent study, and TLP is dedicated to providing the means to that end. God bless, and good reading. Slash existing medical costs by 75% or more, legally! Learn the 3 secret phrases that make collection agents hang up on you, and never call back. Keep your whole family safe from bankruptcy due to unexpected healthcare costs. Never buy insurance! Enjoy security through knowledge, instead. Free manual teaches simple procedures anyone can master. Hospitals never tell you in advance how much something is going to cost. In essense, they are asking you to sign a blank check. Insurance companies negotiate with hospitals in advance, to get reduced prices. This means hospitals might have dozens of different rates they regularly charge for the same service. My research indicates Blue Cross Blue Shield, for example, often pays only 12 cents for every dollar billed by the hospital! A bill for $30,000 might be settled for $3,600! I show you how to get the same price breaks the insurance companies get. It turns out that holding the hospitals to an objective third-party standard is actually reasonable and lawful. My methods work so well they seem too good to be true. No advertisement can do it justice. So I decided to give the book away free-- well, most of it. The free version explains my procedures in detail, so you can see for yourself whether you think this method is right for you. I explain how the Hospital uses carefully worded clauses in their admission forms to screw you, and how you can protect yourself. 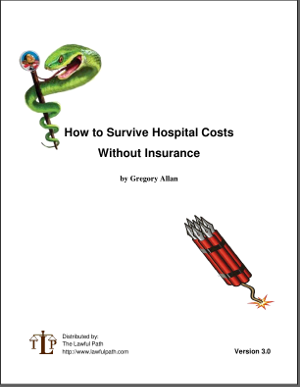 I show you how Hospitals use the law to enforce their contracts, and how you can use the same laws to your advantage. I'll explain why hospitals have not been able to stop my readers, even when the hospitals know in advance every move those readers are going to make. When the bills start coming in you will respond with letters. You will not have to talk to bill collectors on the phone. How will you know what to write in the letters? That's where my Full Report comes in. The full version of the book contains all the letters you need to exercise the rights and powers you learned about in the free version. When you buy the Full Report, what you're really buying is the letters. Since I started doing it this way, I've sold thousands of copies, and had positive feedback from hundreds of happy readers. You can get my Evaluation Copy, by subscription, absolutely free, and then make up your own mind whether you need the letters. The complete text of the email book, in an easy to read and print format (PDF). 16 separate letters, written for every conceivable circumstance. Each letter has been tested and is known to have worked. All new and updated in this new version. Two clear, easy to follow flowcharts that show which letter to use, and when. Detailed instructions for using the Conditional Draft. The Phone Script, containing the three short "magic phrases" that make bill collectors run for the hills. Keep this by the phone. Certificate of True Copy - Perfect records, certified by affidavit, strike fear into even the most seasoned attorneys. Access to our private forum for the newest information. Purchase the full report Now! 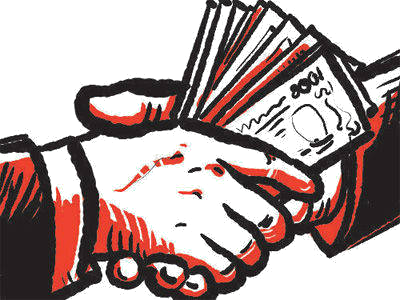 In this groundbreaking video, investigative journalist Janet Phelan exposes one of the most commonly used methods of money laundering, bribes and other financial crimes. Phelan leads you through the steps in researching the real estate assets and loan histories of judges and other public officials. If your local judge or prosecutor is on the take, the methods you learn here will likely help you uncover the truth. As a result of this research, judges have stepped down from cases and in at least one instance, stepped down from the bench. In just one hour, you'll learn enough to begin doing your own research. Janet Phelan is an investigative reporter and author with more than 25 years in the saddle. Her articles have appeared in such mainstream venues as the Los Angeles Times, the Santa Monica Daily Press, Orange Coast Magazine and elsewhere. In 2004, Janet "jumped ship" and now exclusively writes for independent media. at home, just like Mike has been doing for years. Mike makes really good beer. He's been at it for a long time, and he knows what he's doing. 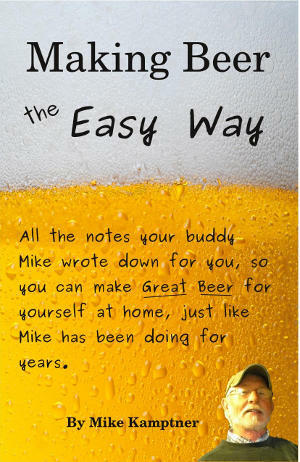 This book does not contain everything Mike knows about making beer. If it did, it would be full of a bunch of boring stuff that you probably don't want to read. What it does contain, is everything you need to know to make great beer, the easy way. It's like having a good friend with you, showing you step-by-step how to do it right, and throwing in a few warnings about what not to do, so you don't waste your time and money. Mike whets your appetite in the beginning by discussing some different styles of beer. Just enough so that you know what to expect. Then he'll show you what equipment and ingredients you need, and some good places to get them. He talks about the importance of cleanliness, and how to keep records so your beer is always at its best. All through the process of brewing, fermenting, and bottling, you'll find color photos to help you along-- Mike will be right there until your beer is ready to drink. In the back are five of Mike's favorite recipes. Each recipe, all by itself, is worth the price of this book. If you're a regular reader of The Lawful Path, you might think this is a strange addition to our catalog. But then, you also know we think a lot of things in this world will get worse before they get better. Economic downturns, shortages, and lots of hard work are most likely ahead. Whether the world gets better or worse, your world may often look brighter at the end of a hard day, with a cold bottle of your own home-brew. Courtesy of Mike, and The Lawful Path. I should also mention that even if you don't drink beer, a man who knows how to make beer will always have something to trade. PDF format, available for immediate download. InflationDeflation is an add-on game to your old-time favorite, Monopoly™. Introduce players to Economic and Political realities while breathing new life into this great game. Players ride the rollercoaster from Boom to Bust and back again, and learn to survive only by slick negotiation with the Bank and other players, and by sheltering their assets from BIG GOVERNMENT and the IRS. This PDF version contains everything you need except the following: A Monopoly™ game, scissors to cut out some new game cards which you print, a half-dozen regular envelopes, and a paperclip. It incorporates some easy to follow, new rules which make the game of Monopoly™ much more interesting. You know that the economy can't last forever, and the country is going down the toilet. That's why you're visiting The Lawful Path. But how do you teach your kids what you know? How do you convince your parents and friends? This is the best method I've ever seen for teaching people the pitfalls of the Keynesian economic system. Best of all, the players don't know they're learning, they're just having fun. Special Note: The TLP staff has played this game with our children, age 7 to 12, and it was fun for kids and adults alike. Boom time was a blast, with grins from ear to ear. Bust was truly tragic. TLP highly recommends this game, we think it will be the best three bucks you've spent all year. We're hooked. We could never go back to playing Monopoly™ the old way again. Try it, and you won't be disappointed. This package contains everything you'll need to draft and file your own deeds. Two complete deed forms, a warranty deed, and a quit claim (also known as "quick" deed). The forms may be printed and used as-is, just fill in the blanks. A much better version of the No Trespass sign found here, with general instructions on how to use this sign to its best advantage. This sign is more accurately described as an offer to rent, although it's doubtful that any sane person will agree to the terms. 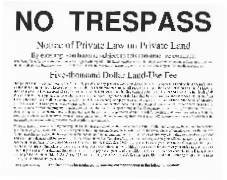 It creates a very specific constructive contract between the landowner and the would-be trespasser. Also included: Gregory tells an amusing story of a run-in with the Michigan Department of Natural Resources (DNR), in which the sign worked like a charm. "Can a Husband Represent His Wife?" 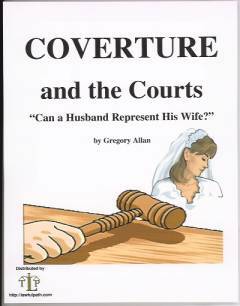 We've had many requests over the years for information on how a husband might represent his wife in court. Gregory Allan is the only man we know who has done it successfully. This report contains the text of our newsletter, The Lawful Path Journal, Vol. 3, #1, in which Gregory tells the story of the day he stood up for his wife in court. In addition, you will find the two documents Gregory presented in court, which compelled the judge to recognize that Gregory was there "as," and not "for" his wife. Detailed instructions are included as to how to fill in the blanks on these two documents. Readers are cautioned that courts are unpredictable, and the Author does not offer legal advice. This is the true story of a successful day in court, along with the paperwork that got the job done. Limitations on Social Security Number disclosure. The SSN was never intended to be a national I.D. number, but these days that is exactly what it has become. With identity theft running rampant, it is more important than ever to never disclose this number to anyone, unless absolutely necessary. Have you ever been told, "We must have your Social Security number, or we can't (whatever)?" I've heard it from banks, video rental stores, hospitals, you name it. Once while I was checking into a Holiday Inn, the desk clerk told me about a preferred members club I could join for free, and begin immediately getting a 20% discount on room rates. The catch? I had to write my SSN on the application. I've been using a variation of this Notice for almost ten years. It explains to the average desk clerk or bureaucrat why it is illegal for them to demand your SSN in exchange for doing business with you. It quotes the Privacy Act, which mandates a minimum $1000 fine for violations, and also quotes from several interesting and pertinent court cases. The Notice is very intimidating, and thus quite useful. I can't remember where I got the original, but I've re-written it to make it more effective. I've never sued for the thousand bucks, and don't know how easy that would be. But in my experience there are very few people who want to take the chance. The clerk in the above example still wouldn't let me join the club, but he gave me the 20% discount and the continental breakfast.